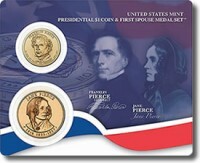 The 2010 Pierce $1 Coin and Medal Set is the second such set offered in 2010 from the US Mint and includes an uncirculated Franklin Pierce Presidential $1 Coin as well as a Jane Pierce First Spouse Bronze Medal. These set combine offerings from two different program of the US Mint – the Presidential $1 Coin series which honors former Presidents of the United States and the First Spouse Coin Series which honors the spouses of those presidents. The Spouse Medal is a likeness of the Gold Spouse Coins produced by the Mint. Those gold coins are struck from 1/2 ounce of 24 karat gold. The authorizing act for both coin series dictates that in the event the president served without a spouse, an image of the mythical figure of Liberty would be used on the spouse coins and medals. If the president had two spouses while in office, both would be featured on separate coins and medals. The Pierce $1 Coin and Medal set includes both the uncirculated coin and medal mounted in a plastic card with colorful images of each honored individuals imprinted on it. The United States Mint released the Pierce Coin and Medal Set on June 24, 2010. Issue price on the Pierce Set is listed at $11.95. Susan Gamble designed the portrait of Franklin Pierce found on the obverse (heads side) of the uncirculated coin. It was sculpted by Charles Vickers. The reverse (tails side) of all of the Presidential coins was designed by Don Everhart to show an image of the Statue of Liberty. Donna Weaver is the designer of record for both the obverse and reverse of the Jane Pierce medal. The portrait on the obverse was sculpted by Don Everhart, the reverse by Charles Vickers. On the reverse, an image of Mrs. Pierce sitting while listening to a debate is shown.